In the early 1960s, newly minted government jobs drew young Orthodox Jewish professionals to the Washington, D.C. area. Many of those people settled in the Summit Hill apartment complex, just across the Maryland-DC line, in Silver Spring, Maryland. Several miles from the established shuls in Washington, the young newcomers walked down 16th Street every Friday night and Shabbos to the established congregations of Ohev Sholom or Beth Sholom. Over the next few years, as the small community grew and strollers became more essential, the long walk through muggy or snowy weather became increasingly challenging, and so fifteen families decided it was time to set up a shul within the apartment complex. At the time, Summit Hill’s party room was a hot spot for residents’ sweet-sixteen parties, and management had closed it after noise complaints from residents of nearby Suburban towers. During the summer of 1963, after the party room had been closed for more than a year, representatives of the fifteen families approached management to ask if the party room could be used as a shul. Management agreed and set the rent at just one dollar a year. The families, which include present-day members Suzanne Amsellem, Eileen Cytryn and Avrom Landesman, quickly set to work turning a party room into a shul. They painted the room and built a mechitza, complete with curtains sewn by one of the shul members. In August 1963, Avrom Landesman became the first president of the Summit Hill Shul. The fledg ling shul’s membership quickly grew as young couples from surrounding apartment complexes began to join. The shul was completely volunteer-run without a single paid employee. Congregants read the Torah, served as Baaleh T’filah, and taught classes. They also established a hospitality committee to welcome guests to the area. 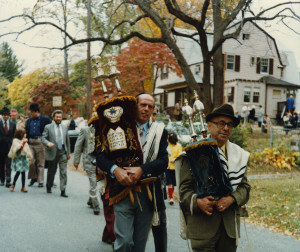 An annual Simchat Torah Kiddush was inaugurated, as was an annual Purim Shpiel that quickly became legendary. In those days, shul dues were $25 a year – quite a bargain some might say. In the beginning, following Shabbos morning services, families gathered for a simple kiddush of coffee and cake, followed by a half-hour Chumash shiur. As the shul grew, so did the kiddush, from whiskey and some herring to potato kugel and the occasional cholent. In 1966, the “mini-shiur” was introduced, delivered after kiddush by a different shul member each week. As the Vietnam War escalated, a new influx of doctors and other professionals came to Summit Hill to serve in government and in other capacities. By the late 1960s, the shul’s membership ballooned to about 150 families. In the meantime, congregants were busy building the community around them. Shul members started a nursery school in 1964 and helped open the Yeshiva High School that same year. After the 1968 riots made it dangerous to reach the mikvah in downtown Washington, members of the shul were instrumental in moving the mikvah to Georgia Avenue in Silver Spring, where a branch of the mikvah still operates today. The shul board advanced $14,000 of pledged dues to finance the mikvah’s construction, and congregants served as the mikvah’s first officers. By 1970, many of the shul’s young families had outgrown their Summit Hill apartments. Some members moved to the Kemp Mill neighborhood of Silver Spring or out of town, while others members moved to nearby Woodside and continued to walk to the Summit Hill shul every Shabbos. As more members moved to Woodside, the Landesmans, who had recently bought a home there, began using their basement as an auxiliary minyan for Friday nights and Shabbos mincha. In 1974, the congregation purchased a house on Highland Drive to serve as the Woodside shul. This measure proved to be only a temporary solution for the community’s needs, for by 1977, the shul membership had grown too large for the basement of a house, and so the shul purchased its current site — Alton Farm, a Civil War-era farmhouse on the corner of Georgia Avenue and Noyes Drive. Many believe the building’s original cellar served as a stop on the Underground Railroad during the Civil War. The Summit Hill congregation quickly turned the small house into a modern, thriving community shul. With a firmly established building and location, the shul set out to build an eruv in consultation with Rabbi Moshe Heineman of Baltimore. Completed in 1982, the eruv made the shul more accessible to young families. The shul population quickly outstripped the small original house and set about expanding the space. The addition, completed by Pesach of 1983, included a new sanctuary and fully equipped kitchen. The shul membership continued its steady growth and it soon became obvious that another expansion was needed. However, even before a construction plan for this effort was developed, disaster struck: An arsonist set the building on fire. When passing motorists saw flames shooting from the shul’s windows, they sounded the alarm. People from the neighborhood rushed to the scene and firefighters rescued the Sifrei Torah, which were safely carried out of the smoking building. However, while congregants and others watched helplessly from the street, many of the sforim burned, and the shul suffered severe damage. Investigators quickly determined that the fire had not been accidental and camera crews crowded the lawn to cover the story. Shul officers stood on the hill before the smoldering building, assuring the public that no one in the neighborhood would have set the fire for anti-Semitic reasons. Behind them, while the cameras were rolling, other members were busy passing the charred remains of sforim from hand to hand, gathering them for burial. The community, both Jewish and non-Jewish, responded with an outpouring of sympathy and aid, offering space, equipment and funds to help rebuild the shul. In the wake of the fire, amid much pain and sadness, the membership made plans to rebuild and enlarge. In the meantime, shul members davened at the Hebrew Academy, and at the Rishe and Gross families’ homes. During this time, while in temporary quarters, members agreed that they were ready for more than a new building — they also wanted a rabbi to lead the shul. It was around this time that Rabbi Yitzchak Breitowitz first addressed the shul in the Hebrew Academy cafeteria. Two years after the fire in 1988, the Breitowitz family joined the Woodside community just as the shul moved into its newly refurbished home. 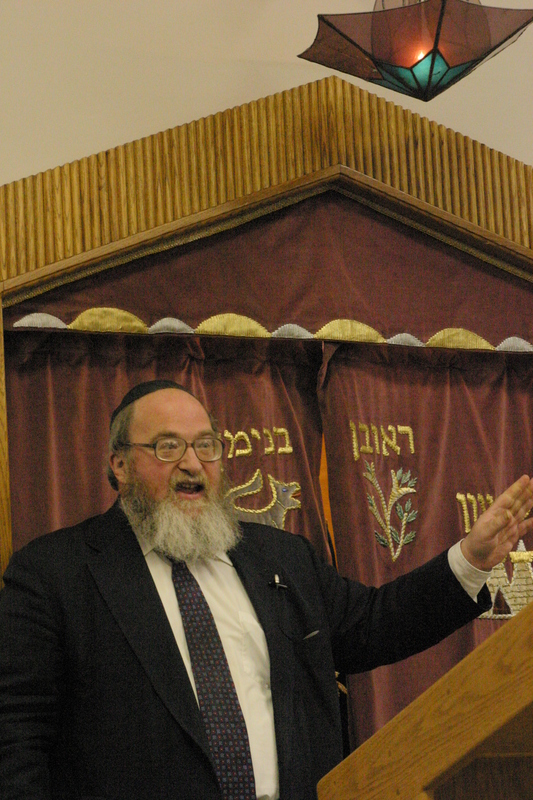 For about 25 years, until Rabbi Breitowitz’s arrival, the shul had operated without a designated spiritual leader. Instead, various members had provided religious and educational guidance on a volunteer basis. The shul was fortunate to engage the services of Rabbi Yitzchak Breitowitz, who together with his wife Sally, had a profound impact on the shul community and on the general Washington DC Jewish community. Their arrival ushered in enhanced levels of Torah study and spiritual vigor in the community. After 22 years of inspired leadership, in 2010 the Breitowitzes fulfilled a lifelong dream by making Aliyah. Rabbi Breitowitz continues to give shiurim and classes in Israel, building upon his reputation for scholarship and devotion to Jews of all denominations. Woodside’s new spiritual leader, Rabbi Moshe Walter, along with his wife, Devorah, and their four (now six) young children, joined the community in 2012. Rabbi Walter’s dynamic and enthusiastic leadership guide the community into its second half-century of Torah learning and observance. Shabbos mornings offer two morning minyanim and four youth groups, serving members of different ages and schedule preferences. During the week, Rabbi Walter offers multiple classes and seminars, addressing various subjects and catering to members’ different interests, schedules, and backgrounds. As Woodside Synagogue approaches its 60th year, it continues to welcome people of diverse ages, interests, and backgrounds. The shul’s services and activities attract people of all ages, and our committed members keep the shul vibrant and stimulating. Although Woodside Synagogue has come a long way from the Summit Hill party room, the ideals upon which it was founded remain: Torah learning, community involvement, giving to charity, and participation in all aspects of Jewish life.